In Startup Stories Part 18, I had written about the different kinds of businesses one can start, and which ones are more suited for Venture Capital (VC) funding. If you’re starting a high-growth startup that is scalable to a large enough market (and hence venture fundable), then you should take exit strategies into consideration. This is because when VCs invest in your startup, they’re expecting an average Return on Investment (ROI) timeline of between 5-10 years, for roughly 10x the original amount they put in. 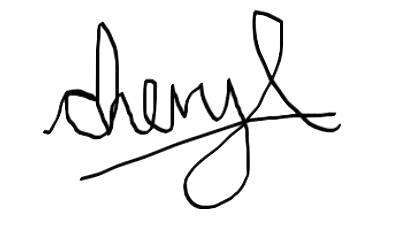 For illustration purposes, assume that a VC invests USD$100,000 into your company in a Seed Round (usually the second tranche of investment after your initial Friends and Family or Angel Round) and your company is being valued at USD$500,000, they would expect your company to exit in say 7 years, where they would make USD$1,000,000 (10x), which means that your company’s valuation would have to be worth USD$5,000,000, assuming that you have not raised any additional capital after that Seed Round. If you raised a Series A, B and/or C (subsequent rounds of capital) after the Seed Round, then your equity stake will be diluted because new investors coming in would’ve taken roughly 20% of your total equity with each financing round. So it would be wise for founders to really understand and consider ahead of time how much you would like to raise for the lifetime of your company, calculate how much of your total equity will eventually be diluted and what is your exit strategy. For example, post Series C, the founders may only be left with 10% of the company. However, by then, the company would probably be worth say USD$100M. So the founders technically still own USD$10M of the company’s wealth, which is still a life changing amount. After all, a small piece of a big pie is better than a big piece of a small pie, or worst, no pie at all (i.e. when the company shuts down because of insufficient runway). Note: “Runway” means how much money is in the company’s bank to support ongoing operations before the company runs out of money. The example used above is for illustration purposes and is largely simplified, not taking into account investment terms such as liquidation preferences etc. There are some founders who prefer to hang onto the ownership of their company at the expense of raising further capital to grow. Though they may own a large percentage of their company, they may not have the cash and capabilities or growth to compete with competitors who have raised more money. These founders run the risk of dying eventually. High-growth startup founders need to understand what their VC’s expectations for an exit are when they raise money from them; whether they’d like to build a company where they could eventually publicly list it on NASDAQ, NYSE or ASX, or sell it to a larger company via an M&A. If you do not intend to exit, then you should not raise VC funding because you may be building a family business that you’ll want to pass on to future generations, in which case taking out a bank loan may be a more appropriate capital strategy. To explore potential exit strategies for Malaysian startups, MaGIC did an analysis of past regional exits. In Silicon Valley, we hear of the big firms like Google, Facebook, Airbnb acquiring smaller startups, but where will the M&As in Southeast Asia came from? This is important within the equation of “startup ecosystem building” because without exits, all our efforts at MaGIC to spur high-growth startups would not be sustainable because i) early investors and entrepreneurs will not have liquidity to reinvest their profits into future startups, ii) it would be tough to attract the brightest talent to found companies if they don’t see financially viable exits that would justify the risks they’d have to take to leave a comfortable salaried job. 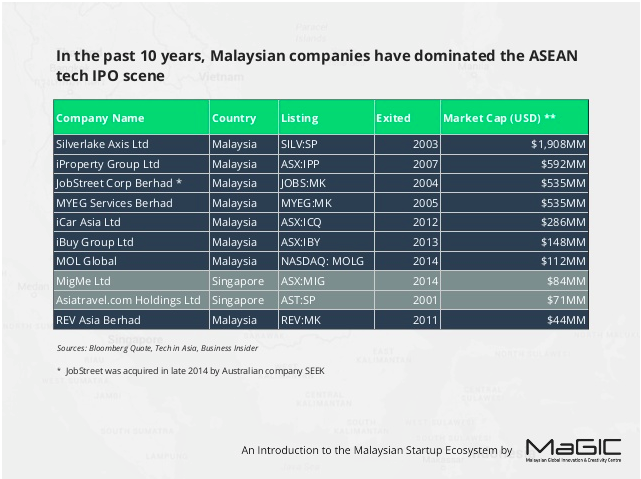 We’ve observed that in the past decade, 80% of Southeast Asia’s Top 10 tech IPOs are from Malaysian founders or Malaysian-based companies. The other 20% are Singaporeans. Malaysian companies prefer to list at the ASX because 1) they get better valuations as Australian investors understand and place a higher premium on tech products than its Asian counterparts, 2) looser regulatory requirements (eg. biannual versus quarterly reporting requirements) to list and maintain, 3) quicker process than most other exchanges in the world, where a deal can be closed in 6 months on average. On the flip side, when it comes to M&A, Singapore takes lead with 36 acquisitions coming from larger tech firms in the USA, while Malaysia is in third place with 12 acquisitions, mostly coming from Australia. We believe this is the case because American companies are more comfortable with Singaporean entities, the language / culture and the legal system there versus any other country in Southeast Asia. We predict that in the next decade, we will see more post-revenue tech companies preferring to list on the ASX, while most acquisitions of Malaysian startups will come from Japan Australia and perhaps China. This is because there’s a push for capital to flow, especially out of Japan. Those who are big enough to acquire smaller startups are Rakuten, Softbank, DeNA, Recruit etc from Japan, and potentially Tencent, Alibaba, Baidu from China. On the other hand, Australia has always been known as the “marketplace capital” of the world, where companies like Seek, iSelect, CarSales, 99Designs, ThemeForest, etc thrive. These companies will likely be interested in similarly synergistic marketplaces in Southeast Asia to strengthen their position in APAC, perhaps making them a better acquisition target for a US-based large firm, should they themselves choose to exit. Such is the name of the game in the tech startup and VC world. The caveat of this article is given that the entrepreneur is creating a product of real value to the marketplace with a solid business model, and not merely trying to “flip” the company in an exit, whose strategy historically never works. That said, high-growth entrepreneurs should really consider the type of company they want to build with the desired exit plan, which then corresponds to the type of investors they approach. Knowing this will provide the entrepreneur clarity and focus on the path ahead, before they jump on the bandwagon of starting a high-growth venture.